Lenovo's lineup of ThinkPad laptops has not been updated at CES as in the last years. Thanks to a leak coming from China, we now know Lenovo's plans for 2019. The ThinkPad roadmap 2019 includes informations on when which models are to be released and which models will merely receive CPU updates. In the last years, Lenovo has consistently updated the bulk of its ThinkPad lineup around the Consumer Electronics Show in Las Vegas, which happens annually in early January. Curiously, this did not happen this year. Lenovo only announced two new ThinkPad laptops at CES: The ThinkPad X1 Carbon 2019 and its convertible brother, the ThinkPad X1 Yoga 2019. The well-known T series meanwhile was not updated. 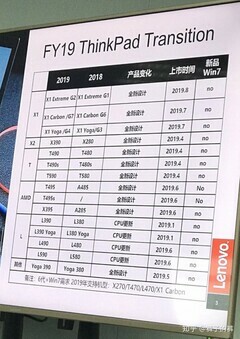 Thanks to a roadmap leak of Chinese origins, Notebookcheck was able to obtain informations on the release dates of most new 2019 ThinkPads, which includes the T series as well as most other models. Besides the premium X1 ThinkPads, the T series is probably the best known sub-series of the ThinkPad brand. The T series has been around since the IBM days in the early 2000s and it has been updated roughly every year since. The 2019 models of the T series will be released in two waves: The Intel based models ThinkPad T490, ThinkPad T490s and ThinkPad T590 will be released in April. According to the leaked Lenovo slide, these new models will not just be CPU updates, though we do not know at this point which new features will be included. In June, there will be a second wave of T series ThinkPads, which will include the new ThinkPad T495 and ThinkPad T495s. In Lenovo's naming scheme, a five at the end of a model number typically denotes a AMD based model, so it seems like Lenovo will release AMD-based T series models for the first time. Apparently, the ThinkPad T495 replaces the ThinkPad A485, while the ThinkPad T495s is an all new option that has no direct predecessor. We would expect these models to contain the new AMD Ryzen Mobile 3000 CPUs. The traditional X series always contained a 12 inch display. Lenovo ends this tradition, as it apparently replaces last year's ThinkPad X280 with a ThinkPad X390 with a 13.3 inch panel. This model will apparently be released alongside the T490/T590/T490s in April. As last year's X280, the Thinkpad X390 will also have an AMD counterpart. This model will be called ThinkPad X395 however and not ThinkPad A395, ending the ThinkPad A series after just two generations. The X395 will be released in June. The X series also includes a convertible option in form of the ThinkPad X390 Yoga. The successor of the ThinkPad X380 Yoga will be available in May, according to the roadmap. The ThinkPad X1 Extreme Gen 2 will be updated roughly one year after the release of the first generation ThinkPad X1 Extreme. This means that Lenovo will release this model in August, later than any other ThinkPad laptop. According to the roadmap, the new model will not just be a CPU update. Also included in the roadmap is the ThinkPad L series, which is an affordable offering made for Lenovo's enterprise customer base. The smaller L series ThinkPad L390 and L390 Yoga were already updated in December, while the larger ThinkPad L490 and ThinkPad L590 will be released in June. The 2019 L series are all marked in the roadmap as pure CPU updates, so no significant design or specification changes are to be expected.